Today I have for you swatches and nail art from China Glaze‘s 2014 Holiday Collection: Twinkle! This collection consists of 12 polishes and has a nice variety of colors as well as finishes – cremes, shimmers, glitters, and even a chrome polish. All photos were taken under indoor lighting. Tip Your Hat is a classic red creme polish. Shown here is ONE coat with top coat. I’ve said this in my previous posts but I am not usually a fan of red polish but let me tell you, it’s definitely growing on me. This polish will most likely become my “go-to” red polish. Not only is the formula perfect, it’s also great for watermarbling! Here I paired it with Finger Paints “Paper Mache” and as you can see, it’s the perfect red-white combination! Out Like a Light is a dark grey creme. Shown is ONE coat with top coat. Great formula, great coverage! No Peeking! is light plum (almost eggplant?) purple shimmer. Two coats with top coat. I wouldn’t normally go for a polish this color but I really love how it looks on me! December to Remember is a blue iridescent polish that has subtle hints of purple and gold shimmers. Three coats, no top coat. I love the added shimmers in the polish. It makes it stand out from your regular blue shimmer polishes. However, I do wish it was a little more opaque. 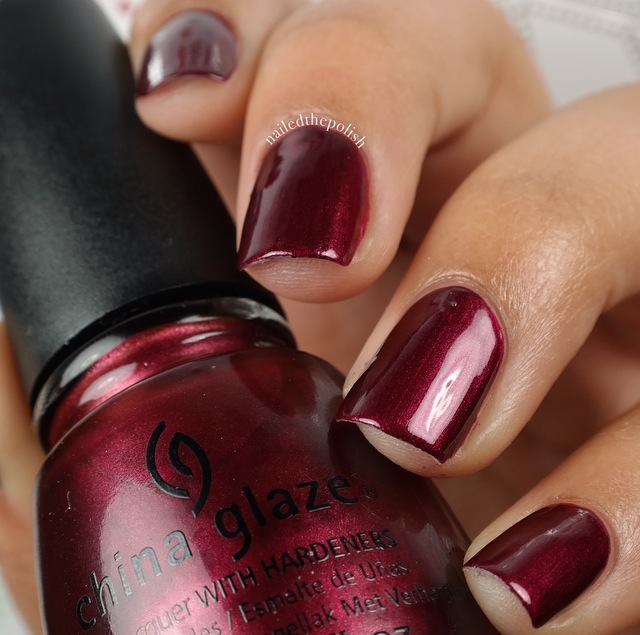 Define Good… is a deep cranberry shimmer polish. Two coats with top coat. I absolutely LOVE this! I’ve worn it several times already and was able to get away with just ONE coat. 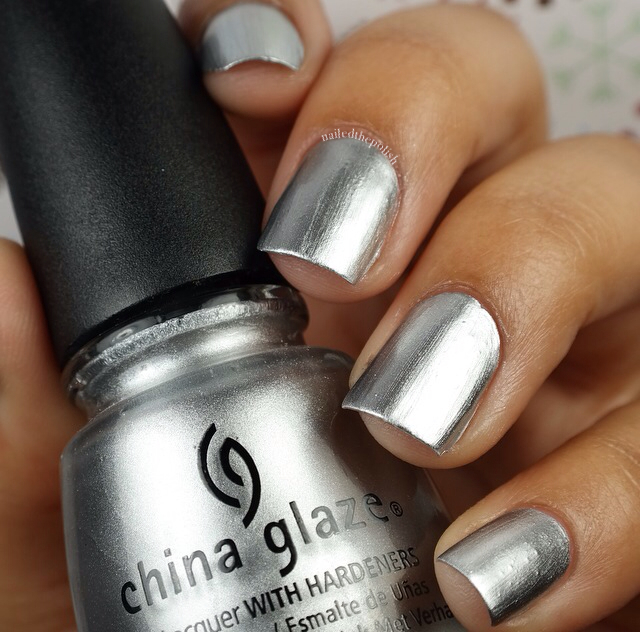 I’d Melt for You is a silver chrome polish. Two coats, no top coat. I was able to get full coverage and opacity in just one coat but was hoping a second coat would cover the streaks. As you can see it didn’t but I suppose that’s expected with a polish of this finish. Don’t think it’s a polish that I’d wear on it’s own but it’ll be great to use under glitter toppers and for nail art. 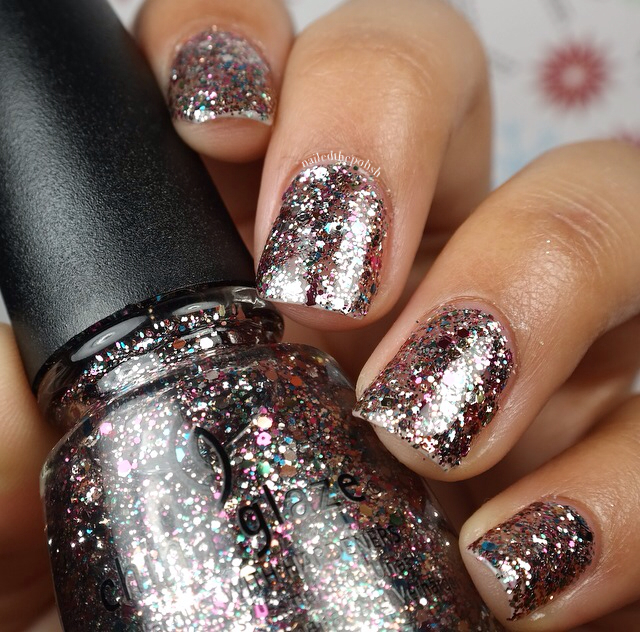 Meet Me Under the Stars is a silver and black glitter polish in a black jelly base. In some lighting, it looked almost midnight blue. Shown here is two coats, no top coat. The first coat was quite sheer so I was very surprised at how opaque it became with just another coat! Chillin’ with My Snow-mies is a multi-sized white hex glitter topper. Two VERY placed coats, no top coat. There is not enough glitter in this polish. I was struggling so much when trying to paint on a coat – all I kept getting was a clear base because the glitters would just fall back into the bottle. 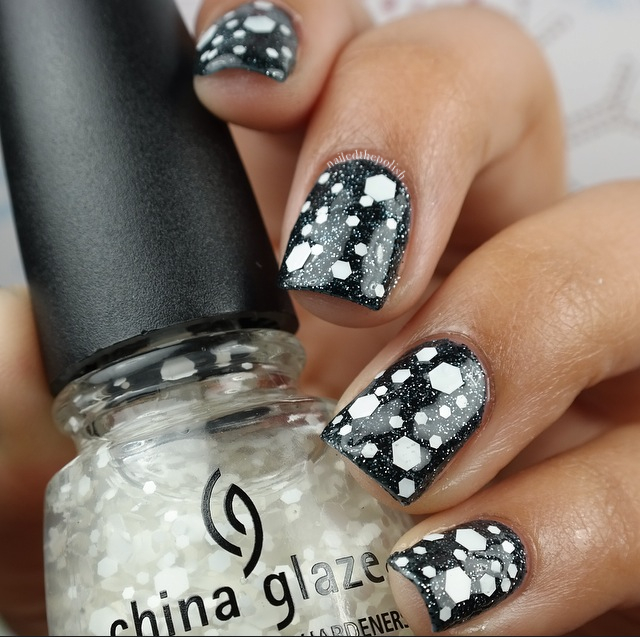 This polish can work if you first paint it onto a sponge to soak up the excess base and dab it on or paint it onto a piece of paper and place the glitters individually. 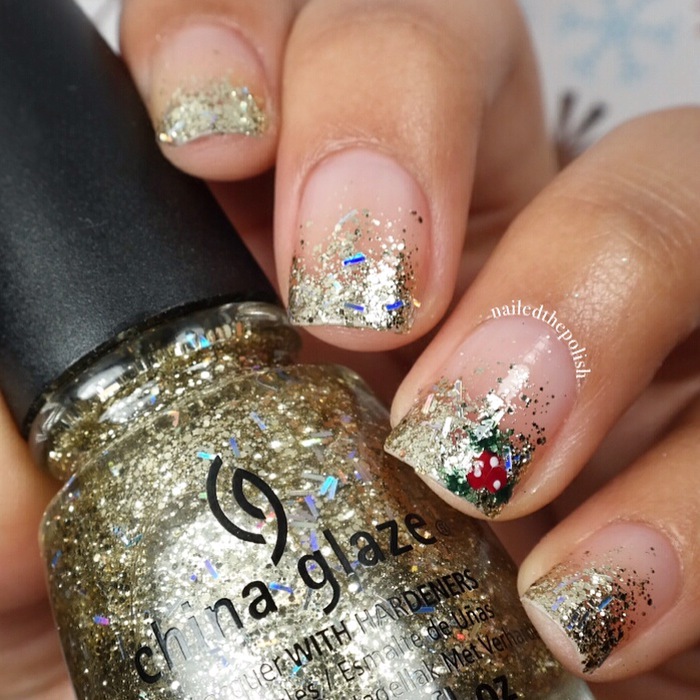 De-Light is a gold glitter topper with holographic bar glitters. ONE coat, no top coat over “Tip Your Hat.” I love how much glitter there is in the polish. There is no fishing needed and you can easily get all of the glitter types in each coat. I wasn’t in love with the polish pairing I did in this swatch so I did a glitter gradient to showcase De-Light on it’s own. Here I used De-Light over my natural nail by first painting it onto a make-up sponge and then dabbing it on my nail. I only needed two coats/dabs to achieve this look. The holly was painted with acrylic paint. Love the holographic aspect of the bar glitters! Dancing and Prancing is another glitter topper with TONS of different color and sized glitters. Three coats over my natural nail with top coat. The name of this polish is perfect because it’s like there is a party on my nails! This is one of those glitter toppers that will work with almost any polish it is paired with. 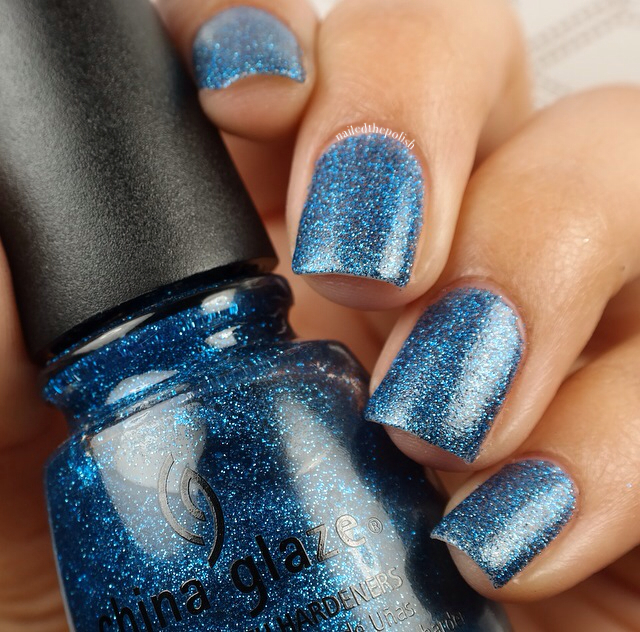 Feeling Twinkly is a vibrant blue glitter polish. Three coats with top coat over my natural nail. This would be great under a blue polish and you would need just one maybe two coats to achieve full coverage. Pine-ing for Glitter is an emerald green glitter polish. Here I have one painted coat and one dabbed coat (using a make-up sponge) on my index, middle, and ring fingers and two painted coats on my thumb and pinky. I’m obsessed with the color of this polish! Here’s a vertical gradient I did using Pine-ing for Glitter and Feeling Twinkly. Both polishes were applied using a make-up sponge. Click here to see a 15 second video tutorial! 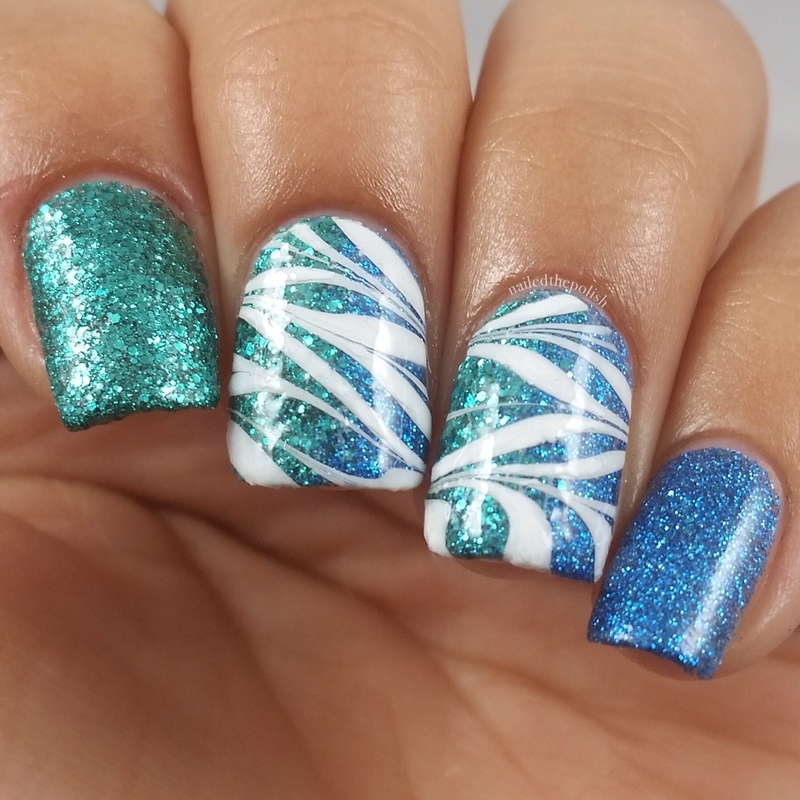 I couldn’t resist adding a clear watermarble on top of the two gradient nails! I used OPI Nail Envy and Finger Paints Paper Mache. I really like this collection as a whole. It has your holiday staple colors – gold, silver, red, and green along with a few others that you wouldn’t expect but are great for the holiday season! Application and dry time are great, as you’d expect from China Glaze. My favorites would have to be “Pine-ing for Glitter”, “Define Good…”, and “De-Light”.